You didn’t really need a Google+ account until now. You might have one whether you wanted it or not. But YouTube’s new commenting system requires a presence on Google+. And there’s no real alternative to YouTube for video. Google+ may have mattered before in theory, but now it matters in practice. Google+ is really a social identity data layer designed to help Google personalize all your products and improve ad targeting. The more it knows about you, the better it is at giving you a good experience and making money. Long-term, social is not an option for the search giant. It’s a necessity. Before Google+, Google knew who you emailed and maybe Gchatted with. Depending on whether you browsed while signed in to a Google account, it would know what you searched for and mapped. If you were on Android or used its other products, it might have known a bit more. But it didn’t know or had to guess about your age, education and work history, interests, and social graph. So Google+ launched in 2011 under the guise of a social network. That’s a convenient way for a company to get you to volunteer a ton of information about yourself. Personalize a profile with biographical info, add friends and colleagues, follow brands, and +1 and comment on your feed. Sounds great, seven years late. Facebook and Twitter handled much of this and had already built strong network effects. You could go elsewhere for social networking, so didn’t you need a Google+ account yet and Google wasn’t getting the juicy data it wanted. Google began requiring a Google+ account to sign up for Gmail at the start of 2012. Many would argue that Gmail is the best email provider, but there are alternatives. And if you did end up with a Google+ account (though not yet required for Gmail users), there wasn’t anywhere it was mandatory to use. Even passively, though, having a G+ account lets Google start tying usage data from across its products to your identity. Google went a step further pushing G+ when it unified Google Talk (Gchat) with Google+ Messenger into Hangouts which requires a Google+ account. Still, there’s plenty of other messaging options like SMS, Facebook, and WhatsApp. But if you want to watch home-made cat videos, or music videos, or viral videos, you’re going to YouTube. It dominates the space. Sorry, Vimeo and Dailymotion. And if you want to comment on a YouTube video, Google announced yesterday you’ll soon need a G+ account. The whole YouTube (and Blogger) commenting system will shift to be powered exclusively by Google+. All comments must be tied to an account. For users, this change will likely be wonderful. First, it should banish some of the trolls spewing racism, sexism and homophobia. The anonymity of a one-off YouTube account created a safe haven for filth. People will still be able to create a pseudonymous G+ account and comment from that, but having to switch back and forth between that and their real accounts could be enough to silence some of the slurs. A more compassionate Internet, ahoy! But for Google+ itself, becoming the backbone of YouTube comments makes it mandatory for a much wider audience, and could breathe life into what many consider a ghost town. It’s not a ghost town. There are some lively, in-depth conversations going on between some smart people on Google+. But for many, their feed looks more like the occasional link post from a friend and a stream of photos, stemming from the social network’s early support for high-resolution shots and its new native Snapseed filters. There’s no denying that despite Google saying Google+ as an identity layer has 500 million “users”, the G+ stream could do with more engaging content. That would convince people that their profiles were worth filling out, quenching Google’s thirst for data. Initially, the YouTube integration will drive Google+ sign-ups from a critical demographic — the youngins who spend all day on YouTube. Capturing that audience is crucial to G+’s social network avoiding a reputation of being old and boring. With time, the integration could fill G+ with more content — something sorely lacking due to low visitation and the lack of a real write API for letting users push content there from other apps. You’ll easily be able to syndicate comments you leave on YouTube to Google+, effectively sharing the video you were talking about, too. 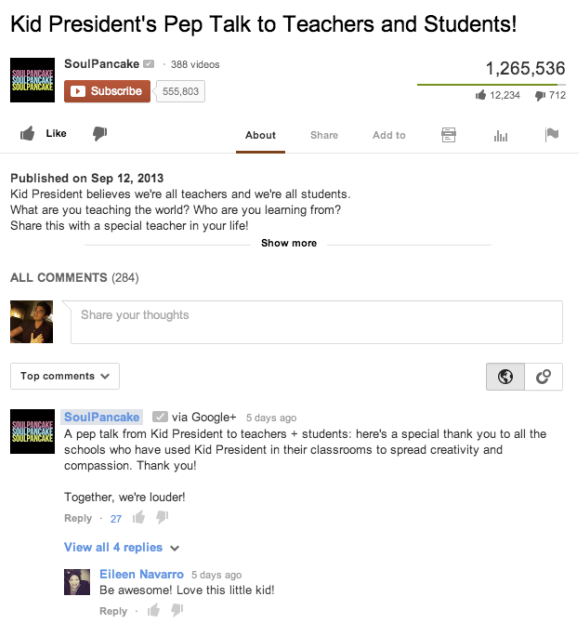 Those comments on YouTube or shares to G+ could inspire replies you’ll come back to check, generating more engagement. Knowing who you converse with about videos will strengthen Google’s understanding of your social graph. The move could also bring more celebrities onto Google+. Recruiting public figures has been a fertile strategy for Twitter and Facebook. Since video uploaders get comments on their own videos ranked high, you might see more celebs uploading YouTube clips from their own accounts, and commenting on those of their famous friends to get more exposure. Normal folks might gravitate to Google+ if it means getting close to the stars they love. We can only guess how the all-seeing, all-knowing Google will use our YouTube viewing history to target ads now that its tied to our identities. If you watch a lot of videos tagged “cycling,” perhaps it might know to show you more ads for local bike shops and events. It could also use viewing data to put you in a cohort and show you ads that worked well when blasted at other people who watch the same videos. It’s been over two years since Google launched Google+, what it internally refers to as its “social spine.” The goal always seemed to be to weave it through all of Google’s products cautiously enough and with enough added benefits to avoid epic backlash. True traction and engagement has been slow, though. YouTube holds a huge growth opportunity, yet its users are among the prickliest in the company’s ecosystem. But by using the power of social to sanitize YouTube comments, one of the dirtiest corners of the web, Google+ may win a place in the hearts and identities of millions.